Being a proud Canadian, I am extremely passionate about this country’s future. There is so much energy and innovation transcending in our true North and I believe that Canada’s future will defined by the innovation economy. Since 2016, the digital economy has grown by $2.43 billion or 3.4% – 1% higher than the growth seen in the Canadian economy overall – and in 2017, the employment of ICT professionals outpaced the entire economy by a rate of 6 to 1. In February, the Information and Communications Technology Council (ICTC) released a study that said the projected adoption of data-fueled Artificial Intelligence (AI), 5G connectivity, Blockchain, Virtual and Augmented Reality (VR & AR), and 3D Printing will herald a new era of heightened demand for skilled talent, while also generating a contraction in low skilled jobs. ICTC estimates that Canada will need more than 216,000 digitally-skilled workers across the economy by 2021. These are astounding numbers, and in order for Canada to capitalize and lead the AI revolution, we need to arm local talent with the proper skills and training to help get us there. AI is no longer a concept of future-based science fiction; it is being utilized today across a wide range of industries. InDro Robotics and Rubikloud are just two examples of companies that are using the Microsoft Cloud to revolutionize their industries with AI and we’re just scratching the surface of what’s possible. IDC estimates that by 2019, 40% of digital transformation initiatives will use AI services and by 2021, 75% of enterprise applications will use AI – so the opportunity is enormous. But transformation requires will and skill. In a study of 3,000 executives, Boston Consulting Group found that 85% believed that AI would provide a competitive advantage, but only 20% had extensively implemented AI into their business. Less than 39% had any AI strategy at all. Tapping into existing talent streams to fill immediate skills gaps, while working closely with academic institutions to ensure a steady pipeline of graduates, will be critical to meet the needs of the digital economy. 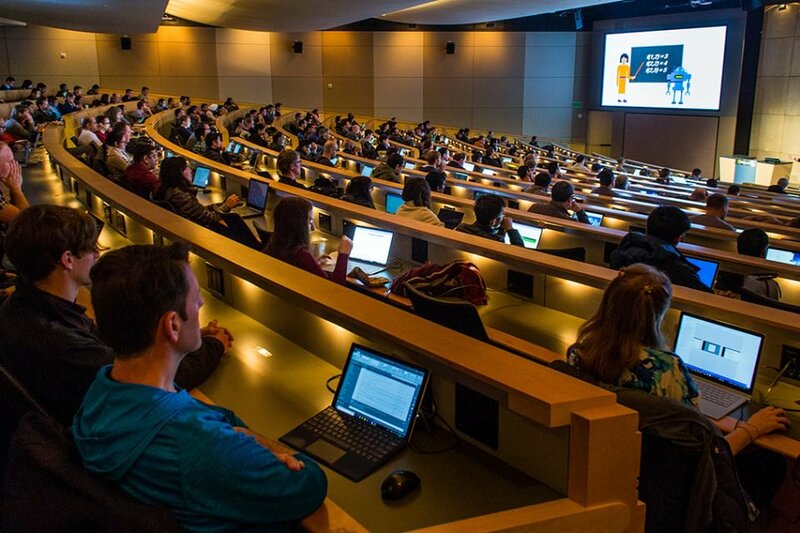 That is why, starting today, we are excited to announce the Microsoft Professional Program in AI, the latest learning track open to the public. The program provides job-ready skills and real-world experience to engineers and others who are looking to improve their skills in AI and data science through a series of online courses that feature hands-on labs and expert instructors. The program is part of a larger corporate effort that also includes the enterprise developer-focused AI School, which provides online videos and other assets to help developers build AI skills. That program includes both general educational tools for developers looking to expand AI capabilities and specific guidance on how developers can use Microsoft’s tools and services. At Microsoft, we are committed to democratizing AI for everyone, and this program is just one example of how we are acting on that promise. Recognizing a shortage of qualified individuals to fill the growing need for specific job roles, Microsoft Professional Program is a new way to learn the skills and get the hands-on experience these roles require. After passing all courses in the track and completing a final project, individuals earn a digitally sharable, résumé-worthy credential that confirms mastery of these functional and technical skills. We are already helping technology workers learn with programs like Azure for Students, Microsoft Imagine and Microsoft Student Partner Program, and now, with the addition of the Professional Program for Artificial Intelligence we will teach the developers the skills that are defining the next generation of software solutions. Human-like capabilities which understand natural language, speech, vision, and make inferences from knowledge will extend software well beyond the app. Programs that provide AI skills, combined with programs that teach coding and soft skills like active listening, communication and critical thinking will help foster the future leaders of tomorrow. The evolution of the workforce will continue to shift and it is clear that companies – and countries – that embrace these changes, rapidly and effectively, will fare best. New jobs and economic growth will come to those who embrace technology, not those who resist it. For Canada to play a leading role in amplifying human ingenuity with AI, we must continue to develop strong IT talent and support local homegrown Canadian companies. We will continue to work with partners, academic institutions and government to help Canadians skill-up for the AI-powered world. By doing so, I believe that Canada will not only succeed in the AI era, we will play a crucial and respected leading role.